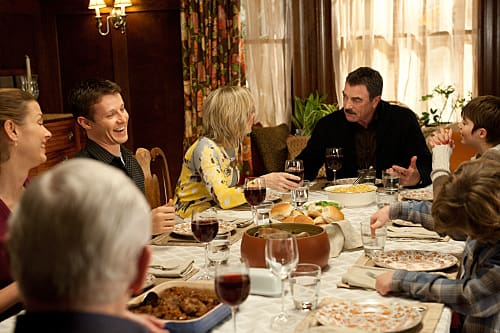 Blue Bloods Review: "My Funny Valentine"
This week’s Blue Bloods didn’t give me a lot of confidence in Danny and Jackie’s ability to handle a kidnapping. On "My Funny Valentine," the kidnappers specifically said if they saw any police they would kill Chloe. Having what appeared to be half the police force in their living room seemed like it would cause a lot of attention. If anyone had been watching their home, it’s hard to believe they wouldn’t have noticed. Even worse? When Danny and Jackie followed the guy who just picked up the diamonds at the ransom drop. Danny’s gold shield was clearly visible on his belt as he ran. If the guy turned around, he would have caught the sun gleaming off of it. Not the stealthiest operation. Then, they tackled the man because he was going to open the thermos. So what? Why would everything fall apart if he opened it? Of course, this guy was just some junkie who was paid $100 to pick up the ransom. The kidnappers didn’t want to risk getting caught themselves Good call. It’s scary to think that a couple of teenagers who spent the weekend watching movies could get away with as much as they did. But “My Funny Valentine” wasn’t all about this plot. Erin and Rosselini had some nice banter, which Erin’s daughter noticed. Then, Nicky made a questionable call: she invited Rosselini to their Valentine’s day dinner. I really liked that Nicky went to Frank when she started to second guess her decision and I love how Frank handled it. He admitted he didn’t like the guy, but that his feelings weren’t the point of this conversation. I was thankful that Nicky told Erin about the plan. I like Rosselini and Erin together, but if he had shown up unexpectedly at Valentine’s dinner, it could have been extremely awkward. With a family that pulls together like this, I’d say they’re already fairly lucky. Renzulli: But Valentine's Day. That's when I go all out, Kid. Jamie: What's all out for you Sarge? Two for one Mondays at The Pig & Whistle?